The community in which you live can be more than just the area surrounding your home. Ideally, it’s a place where your friends and neighbors come together to make a real and lasting impact on one another’s lives, and where your children learn to contribute to not only their household but also the world around them. In today’s increasingly distant and aloof society, however, it’s not always easy to know where to start. It’s not uncommon for next door neighbors to see each other in passing for months or even years without sharing much beyond a curt nod or brief wave, but that doesn’t have to be the norm. Investing in your community as a family goes far beyond financial investments, and will change the world around you in noticeably positive ways and help your kids learn to do the same as they get older. These are seven of the ways that you can invest, as a family, in your neighborhood. Support Local Businesses – One of the quickest and most effective ways of investing in your community is to shop locally, support small business and contribute to family-owned enterprises by spending your money there, rather than big box retailers. Make a point of buying local, and take the time to explain why it’s important to spend a few dollars more at a local shop than to add to a national corporation’s fat bottom line. Make Charitable Donations – Organize a community garage sale and donate the proceeds to a local charity, make a point of sending your gently used clothing to a community thrift store and encourage your kids to save up for donations of their own to community centers and other outreach programs that benefit the neighborhood as a whole. In addition to making a difference on a local level, you’ll also be teaching your little ones a very valuable lesson about civic responsibility. Volunteer With Local Organizations – No-kill animal shelters, food banks and other local outreach organizations need funding, but they also need the help of dedicated volunteers. Setting aside a bit of time to volunteer as a family will help to strengthen your community while allowing you to all spend a bit of quality time together. Look for age-appropriate programs to get your children involved, and invest your time into making a difference in your neighborhood. Join a Community Supported Agricultural Exchange – Eating locally grown, organic foods is an investment in your family’s health and nutrition. Obtaining that food by working with a community supported agricultural exchange is an investment in sustainable agriculture, your neighborhood and local farms. Either way you look at it, working with or contributing to a CSA program is a worthwhile and valuable way to invest your time, effort and money as a family. Support Elderly and Mobility-Challenged Neighbors – There are ways of helping your community through donations, organized volunteering and working with charitable programs, but you can also invest in your community by getting involved on a personal level. Encourage kids to help an elderly neighbor with gardening or shoveling a snowy sidewalk. As a family, help a mobility-challenged or differently-abled neighbor with household tasks. They’ll benefit from your assistance and your kids will learn about compassion and the importance of helping those who are in need. Build Relationships – Part of what makes a neighborhood into a community of people, rather than just a collection of people who happen to live on the same street, is the sense of togetherness. Greet new neighbors with baked goods. Make conversation over the garden fence. Do what you can to build relationships with the people around you, and encourage your kids to do the same. Organize and Throw a Block Party – A block party is a great way to get to know your neighbors in a relaxed, convivial environment. Get out there, meet your neighbors, organize a potluck and spend time with the people around you. Your community and your family will benefit from the relationships fostered through a group celebration, which can also help to instill a sense of community pride. Because every community is as unique as the people living within it, you should make a point of looking for new and creative ways of making a difference and investing your time as a family to affect positive change. Tailor your approach to the needs of your environment, making the neighborhood not only a better place for your children to grow and mature, but also a better place for everyone around you. The first words out of most kids’ mouths when they return home from school usually have something to do with how hungry they are. Questions about their day, discussion of pertinent issues and even pleasant greetings take a backseat to finding food, which is why it’s so important to have plenty of ingredients on hand to throw together quick, easy to make snacks. As the rates of childhood obesity and attendant health risks rise, however, it’s also important to make sure that those snacks are healthy. These are 10 snacks that are sure to please, and won’t require all afternoon to put together. Sweet Potato Fries – Frozen sweet potato fries are a snap to prepare, and their fun shape helps kids to be more adventurous about trying new foods. Look for organic varieties in your grocer’s freezer, and bake them rather than opting for fried preparation. They’re a healthier alternative to traditional fries, and are just as good with all-natural ketchup or barbecue sauce. Whole Wheat Toast and Cream Cheese – Light cream cheese can be just as tasty as full-fat varieties, especially when it’s blended with fruits or other favorite flavorings. If you’re not wild about the idea of serving artificial flavorings and additives, spring for an all-natural, plain variety and mix in your own favorite organic fruits and veggies for flavor. Frozen Fruit – The heat of summer hasn’t always passed into the cooler temperatures of autumn when school starts in some regions, and a cool snack is always a welcome treat on a hot day. Frozen fruit is a far healthier alternative to processed popsicles or ice cream and requires almost no time investment at all to prepare. 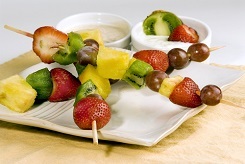 Fruit Kabobs – Skewering slices of organic fruit makes for a quick, healthy and fun snack for your little scholars. Choose varieties that are in season, local and pesticide free for maximum health benefits, and be sure to dip apples in lemon juice to prevent unsightly browning if you’re preparing them in advance. Deli Roll-Ups – Rolling cheese, additive-free deli meat, dressings and lettuce up in sandwich wraps and cutting them into pinwheels makes for a fun and guilt-free snack you can serve to your brood when classes end for the day. Peanut Butter Dip – Provided that your children have no peanut allergies or sensitivities, mixing peanut butter with cream cheese and a dollop of milk will create a delicious and healthy dip for fruits and whole wheat crackers. If there is cause for allergy concern, opt for sunbutter or other nut butters for the same tasty, protein-packed result. Veggie Sticks – There’s something about dipping that makes almost any food fun. Cut raw veggies into sticks and serve them with light dressing, salsa or hummus for dipping. Kids will love the fun of dipping into their healthy snack, even if it doesn’t contain a plethora of added salt, chemicals or additives. Dried Fruit – Dried fruit and trail mixes are fun for kids, and a healthier alternative to chips or other fatty snacks. Dried fruit also isn’t sensitive to spoilage in the same way that fresh fruit is, so mixes can be prepared in advance and stored in airtight containers for extra-fast snack potential. Smoothies – There’s just something about a snack that kids can drink through a straw that’s automatically elevated, even if it contains natural, healthy produce and wholesome yogurt instead of high fructose corn syrup and artificial flavors. Choose organic frozen fruits, and combine them with yogurt, a bit of ice and a dash of milk. They’re just as much fun as a milkshake, with none of the unnecessary additives and all of the flavor. Fruit Leathers – Kids love processed fruit rolls, but they’re full of things you’d rather not feed to your children. Instead of springing for the heavily-marketed, cartoon-adorned and additive-laden fruit rolls on the shelves, check the organic section for natural fruit leathers. Parents and caregivers who are handy in the kitchen can even whip them up themselves, giving you complete control over the ingredients. The idea of “teachable moments” has been popular in education and psychology circles for decades, though it’s blown up in recent years. It’s a simple concept: at certain educational crossroads, teachable moments pop up that make for the perfect opportunity to impart a specific lesson or ideal to a child. As a nanny, you’ll be confronted with many of these each week — sometimes many each day — so it’s important to take advantage of them when they occur. When the child (or children) in your care hit the wall and throw a tantrum, don’t freak out. This is a great chance to turn their meltdown into a learning moment. A tantrum can feel like a runaway train, but you don’t have to stand back and let it happen. Gently (but firmly) redirect the child’s attention to you and the situation at hand. For instance, if they start to lose it because they want a toy that another child is using, guide their attention back to you and start talking about things like sharing, common goals, helping others and being fair. It can be tempting to think you’ve only got two options here (let them whine or walk away), but you’ve got a third if you can remember to swiftly step in and shift the child’s focus on something else. “I’d like to talk about fairness.” “I’m glad you said that, because it’s something we can talk about.” And so on. Kick off a teachable moment with a brief but clear statement of your goals for the conversation. It’s going to be a lot easier for the child to follow you (and a lot easier for you to get to the point) if you set clear signposts at the beginning for what you want to accomplish. Teachable moments aren’t necessarily disciplinary, either, so don’t feel like you have to make your talk about punishment. Instead, use the tantrum as a springboard into an actual conversation about feelings, desires and how the child can do a better job at expressing themselves. Seriously, listen. You’re not lecturing, and you’re not delivering a standard warning against future tantrums. You’re having a conversation with specific goals that’s designed to teach, not scold (though scolding might be ancillary). Teachable moments are spontaneous things, which means you’ll need to pay close attention to the child to determine what they’re really upset about and what they really need. Start with basics: Why did you do that? How does this make you feel? Why do you feel that way? Do you remember the last time this happened? How did it go? Let the conversation flow toward the goals you established, but don’t rush it or feel like you need to force a particular conclusion before the child’s locked in. A kid is like an adult: They’re going to be a lot more receptive to new ideas once they know that they’re actually being heard. It’s impossible to overstate the importance of this one. 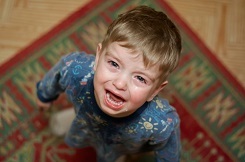 Tantrums are explosions that happen when a child perceives something as unfair and doesn’t know what to do about it, so they cry and scream and pout. They sense an injustice (even if they’re blowing events way out of proportion) and they respond. Setting a good example for them, though, can go a long way toward reducing these tantrums and teaching them how to respond to difficult situations. If your first instinct is to shout and scream, don’t be surprised if that’s what they imitate. If you ignore your own teachable moments, you won’t be able to convince a child of their merits. In other words, don’t just save the teachable-moment behavior (firm goals, genuine conversation, receptive listening) for worst-case scenarios when you’re trying to defuse a tantrum situation. Use them all the time, every day, in multiple ways. Strike up conversations while reading or playing and see what happens and if you are able to guide their natural questions or observations into natural teachable moments. That will make the post-tantrum moments feel like a natural part of your childcare approach, not a bandage on a bad situation. Remember: It’s always possible to turn a tantrum into something better. It might take time, but it’ll work out.